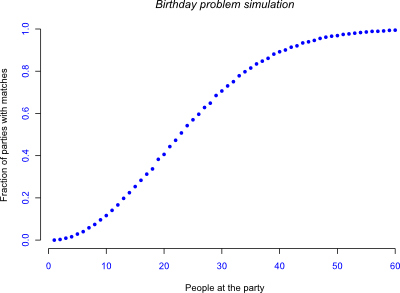 Figure 1: Frequency of finding individuals with the same birthday in groups of various sizes. At 25 people there is already a better-than-even chance of finding two people with the same birthday, and by 50 it’s almost guaranteed! That does seem a little unbelievable, so I’ll refer you to the Wikipedia page on the topic for the math (yes, there really is a page for this). 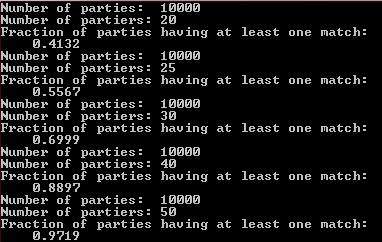 # First add the variable containing each number of people. # Then the variables for the matches in each iteration. Figure 2: Output of simulation. Plotted in R using the Cairo package. 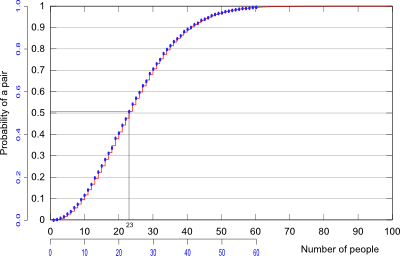 Figure 3: Overlay (using Inkscape) of simulated values (blue) on Wikipedia’s calculated values (red). I love this problem because it blew my mind when I took my first statistics class. I thought, hey, if we have a room of 40 people, there’s almost NO chance of two of them having the same birthday. There’s 365 days in a year! Then we worked through the math and I crapped my pants. Yeah, that’s probably how the average American would approach it. That’s pretty damn sweet. We did this on the first day of stats class as one of those ‘BLOW YOUR MIND WITH KNOWLEDGE’ intros, though I think our class was weird because we had three people with the same birthday, in a group of about 40.